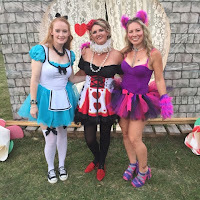 Texas Tuesday- You've Never Seen Alice Like This!! We all have our own comfort zones. Some are big and some are small. Mine tends to be pretty small. I have tried to be better about it. I might try a new food or a new drink. But let's face it. I'm the girl that gets the exact meal at my favorite restaurant. I am afraid of heights so going to Six Flags is pointless. The craziest I get is seeing how far I can go after the gas light came on. That being said, I stepped way out of my comfort zone this past weekend. I am not a dancer and I don't like being in front of a crowd...I did both! I've written about my favorite lavender farm before. They have the Majestic Oak Treehouse and the Shabby Chic grotto that you can rent. I know I've talked about their sugar scrubs before!!! 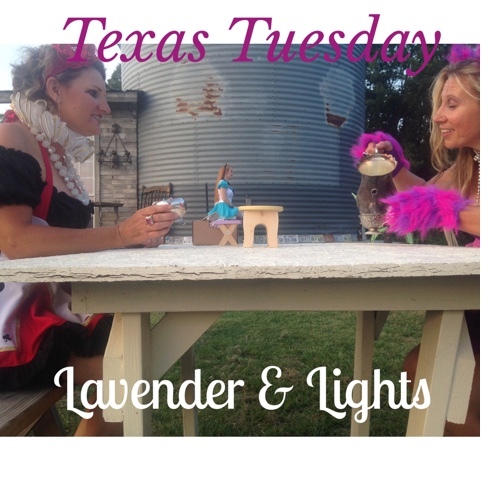 Every year for the past few years, they have held an event called "Lavender and Lights." It's for adults only. Your ticket cost covers an excellent meal so the most you have to bring is your own adult beverages. We had never been before. This year, Gwen asked me to be part of the entertainment. It was the opening "act" to set the mood/theme. The theme was "Alice in Wonderland." Not the cartoon "Alice", Tim Burton's version. All I had to do was a learn a 3 minute dance. Sounds easy enough, right? But I am not a dancer. So with only my dance experience being 1 year of ballet (when I was SIX! ), I went to practice and learned the routine. It was simple enough. Finally the night of came...and I was so nervous!! 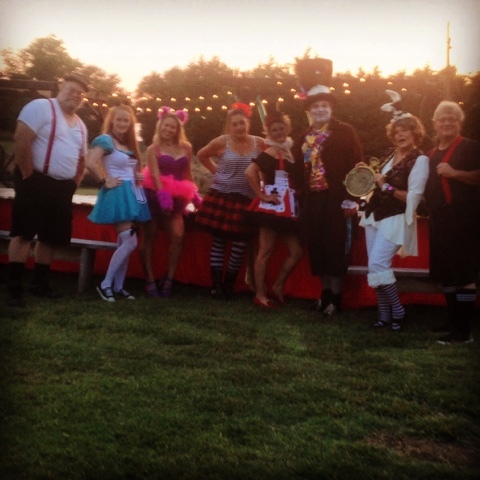 Thankfully, our "cast" was so sweet and supportive! We pulled it off without a hitch! It was awesome! The rest of the night was fabulous. We met people that had come from all over the DFW area. We listened to the vocal stylings of a local singer who sang songs that touched on a genres. There was even a magician there! 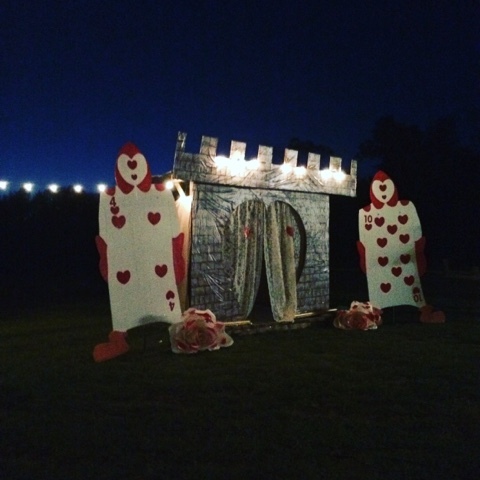 Gwen, Mike and their group of creative geniuses made the farm fit the theme. They had made a giant checker board spray painted in the grass. And if you were feeling crazy, you could play croquet with the flamingo set just like in the movie! This is definitely an event to put on your calendar for next year!! There are a few more events before they close for the year. Make sure to check them out of Facebook or their website! The link is above. They have a Starlight Music Night coming up soon. 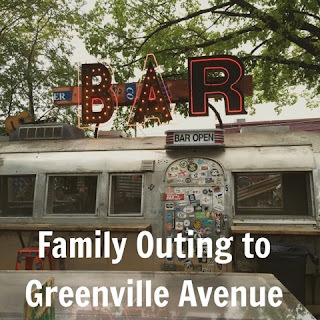 It is a great event to bring the family, a cooler and a blanket to sit on. 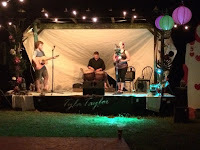 Who doesn't like to listen to live music under the stars?! One of the several TALL mushrooms! Be sure to click all the links. Staying in the treehouse is a "bucket list" kind of thing! I have already checked it off my list! This time of year I am trying my best to get re-organized and re-energize. With the kids going back to school, it seems like a good time. Usually by the end of the year, I have fallen through with the organization part and start back up again with the new year. Last week, I wrote about our new family cleaning schedule (which seems to be working!). 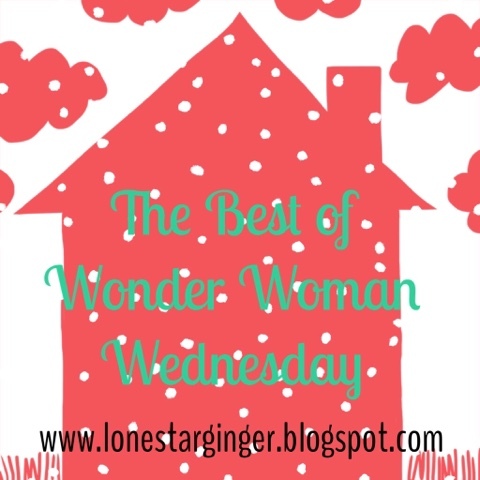 I thought I would revisit some of my posts that were geared toward getting the home organized, cleaned and running like a well oiled machine. If you missed the weekly cleaning schedule, here it is. It has a printout in case you are interested. Another issue that can arise when the kids go back to school is meal planning. The best way I found to do it is sit down and plan (loosely) for the entire month! I sit down with a piece of notebook paper and number it 1-30 (or however many days are in the month). I have my calendar right beside me so I know when we are gone to one of the kids' sporting events. I find the corresponding dates on my notebook paper and mark "out" on those dates. Then I take into account which days I work late. Those are the nights that dinner maybe simple (like chicken nachos, hot dogs etc) or the hubs cooks. Finally, I take my recipe binder and start planning meals for the rest of the month. It sounds much more complicated than it really is... I PROMISE!! Once you get your favorite recipes down, it is easy. The last step is grocery shopping. I usually go to Costco once a month to buy bulk stuff. Then our local grocery store for smaller items. Visit "Oh Snap! What's for Dinner?" to get more info and there's a picture!!! We tend to get busy with the new school year and forget about ourselves. That's why this school year I have started taking a more conscious effort to relax a little. My favorite thing to do is a nice hot bath. I used to shoot for Friday nights but that never usually worked. This school year I have started a Sunday night tradition. That's right... 2 nights means it's a "tradition." We'll see how long it lasts! Another one of my most favorite posts was making sure to take a break for you. It's been over a year since I wrote this post but it's something we need to be reminded of frequently. This past Saturday, we took the kids out for lunch on Greenville Ave. They had never been before. If you go during the day, it's still family friendly:) My little guy has also never been to Trader Joe's (and believe me. He has made sure to not let me forget it!) so that was our first stop. I really love sampling all their cookies and snacks. The cookie butter is to die for! But I bought several jars the last time I went so we were good. I buy a package of cookies and dip them in the cookie butter. It doesn't matter what kind of cookie it is. It tastes even better dipped in cookie and cream cookie butter! The hubs likes to check out the different kinds of beer and Red enjoys the selection of potted plants they have. The Truck Yard opens at 11 so we had an early lunch. I was hoping for a pizza truck but we were a day late. 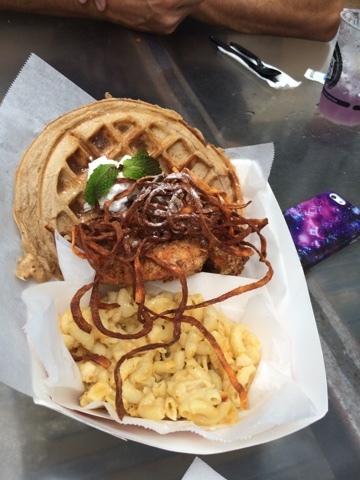 We had a Thai food truck, a brunch truck and a "twisted soulfood" truck to choose from. We chose Nate's 125th Twisted Soulfood. We were trying to be different and give the kids a new experience. They both ordered a regular waffle. (BORING!!) But the hubs and I went a different way. We ordered Chicken and Waffles with a side order of Zesty mac and cheese. A full order (with the mac and cheese) fed both of us. The kids even sampled some of ours. I will be honest...I never saw myself as a "chicken and waffles" girl but I loved it!! The waffle is not too heavy like traditional breakfast waffles. This one almost reminded me of a tortilla. It was topped with whipped cream and a scoop of cinnamon apple mixture. The chicken strips were placed on the side. The kids loved the environment. It kept little guy busy. He loved just looking around and checking out all the neat things hanging around. He picked where we sat...in an old truck bed. After lunch, we walked to one of my new favorite t-shirt places...BULLZERK. They specialize in shirts that are just for the north Texas area. They also sell hats, koozies, cups and kids' shirts. You can see their "work" area in the back so you know everything is made in house. I think that is super cool! My husband owns several shirts from there but I just bought my first one Saturday. The kids each got one too! Going to the State Fair? They have a shirt or two for that. Most adult shirts are $23 which is not bad for a super comfy and cool shirt. The kids are already planning for our next trip down there. Red and Chief want to try out the Greenville Pizza Company. 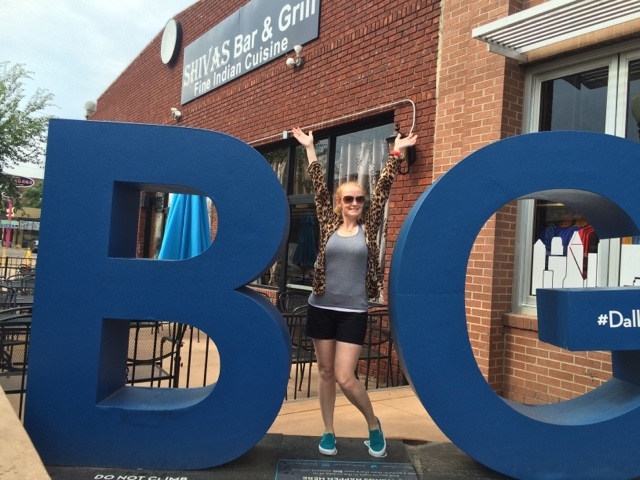 So maybe we'll eat there, buy a new shirt and eat at Steel City Pops! The BIG sign was outside of Bullzerk!! Of course, I had to! I have had chronically chapped lips for a few weeks now. I thought I was addressing the problem with the assorted lip balms and lip repair serums. But each morning I would wake up with dry, cracked lips. 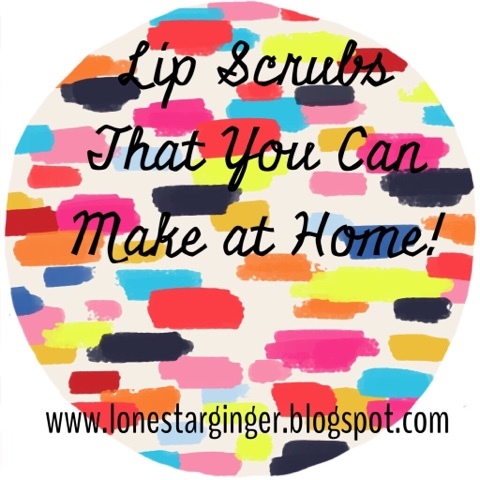 I was playing around on Pinterest the other day (that's code for "wasting an hour that I should have been doing something more productive") and a pin about lip scrubs popped up. Oh my gosh! Why didn't I think of that?! I use a hand sugar scrub whenever my hands are dry. Why wouldn't I use a lip scrub for my dry lips?! DUH!! Below are some lip scrubs I found that sounded like heaven on my lips. 1. Homemade Lip Scrub: I tried this out and loved it! Simple-edible oil, sugar and honey. 2. Raspberry Lemonade Sugar Scrub: The recipe in this one makes enough for a body scrub. 3. Peppermint Mocha Lip Scrub: This one is for all you coffee loving folks! 4. French Toast Lip Scrub: For all you who could eat breakfast all day!! 5. Lemon Honey Sugar Scrub: Sounds really good and will be going on my list to try next. My advice...Mix you up one of these great little scrubs. Draw a nice warm bath (either a detox bath or use a scented bath bomb), apply the scrub to your lips, and lean back for a relaxing time. With most the scrubs, you rub on and wipe off. Since my lips were SUPER dry, I applied the scrub twice during my bath. Your lips will feel amazing! Mine were so soft and not peeling at all. Plus the rest of you will be feeling pretty amazing! Wishing everyone a great week!! Well, it finally happened. I dropped Chief off for his first day of 4th grade this past Monday. We left early enough so I could drop off Red at high school (insert sigh and sad face). I had planned it so that I would have time to walk him in. Then Monday morning I heard the words..."Mom, I am going to walk in by myself." Wow!! He's 9. I know he can't stay little forever. But really, I thought I had another year. This should have been my last year to walk in my sweet boy. He's my last one. There's no more kids to walk in. Boom! Just like that...he's doesn't need me on the first day. He did not need me to help carry supplies. He did not need me to hold his hand as we walked across the busy parking lot. He did not need me to ease him into a new situation. Yep, just like that he did not need me. I was good though. I didn't cry. I did not protest and demand to let me walk him in. I drove through the carpool line, watched him get out and walk into the school alone. I realize this is a big step. It's a step closer to him becoming more independent. A step closer to becoming a man. But this was also the day, I realized he wasn't my baby anymore. Despite my best efforts, his sister and he continue to grow everyday. I can't keep them little forever. They grow closer to us while at the same time grow apart. (Does that even make sense?!) The kids still need us but in a different way. 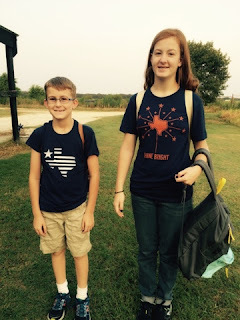 With a 4th grader and a freshman, I don't need to wipe their faces and hold their hands. But they still need my support, encouragement and love...maybe more so than when they were infants. 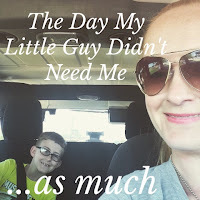 So I begin this school year transitioning into the mom that no longer has little ones. I am in "that place..." I'm not answering their every whim as I did when they were babies. I'm there when they need me. Whether it's helping with math homework (yuck! ), or a sounding board for the latest disagreement between friends, they still need me. Until they need me, I just wait in the background, cheering them on. Thirsty Thursday-An Apple for the Teacher...or Mom...or Whoever Needs It!! Can you believe we have almost made it through the first week of school? September is breathing down our necks. In honor of teachers everywhere, I decided to add another drink recipe that used apples. I will be honest...granny smith apples are not my favorite. But this little sangria recipe is cheap, easy (everything can be found at the grocery store!) and quick to put together. 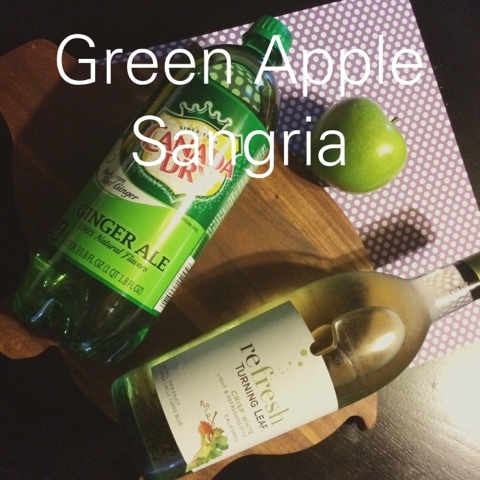 I have seen it on the interwebs as Green Apple Sangria. I think I may make some changes the next time I make it. The grocery list is easy. All you need is a bottle of (750oz) )white wine, 1-2 green granny smith apples and 1 can of ginger ale. 1. Slice your apples thin. I got lazy and ended up doing a mix of thin slices and smaller chunks. You do what makes you happy! Throw them into the pitcher when you are done. 2. Pour your bottle of white wine in the pitcher. 3. Then pour your can of ginger ale in the pitcher. Stir to give it a good mix. 4. You can either enjoy it now OR place it in the fridge to chill for a couple of hours. The next time I make it, I might substitute the large bottle of white wine for sour apple vodka. I will play with the measurements and get back to you! Maybe even add some caramel vodka too?! Hope everyone has enjoyed their first week back. If you're my kid's teacher, I am sorry. He's a handful and here's you a drink recipe to enjoy! 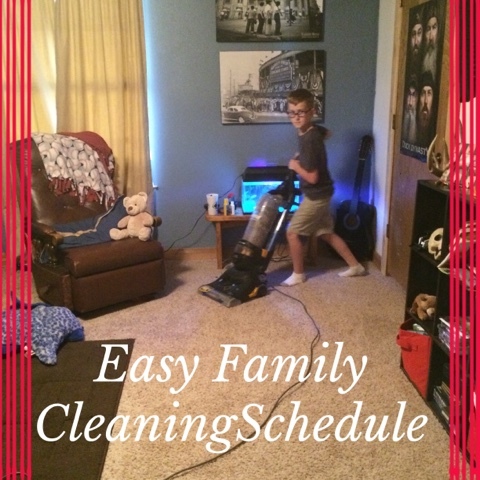 Around this time last year, I wrote about a family cleaning schedule. Not many moms enjoy spending every weekend cleaning...even though there are some who enjoy cleaning. With our busy schedules, our house may not get dusted for over a month...GROSS, I know! We have a dog and live in the country, so the house gets vacuumed regularly-like everyday! But other cleaning tasks seem to fall through the cracks. The cleaning schedule I made up last year seemed to work great during the summer. When the kids started school, it was a little harder to manage. But I think this new one we can manage. It's easier to keep track of the tasks to do every afternoon. Monday through Friday, it's the same tasks. There's no more guessing what needs to be done. The only daily task not on the schedule is homework. The kids know that homework is a given. But sometimes, they like to skip out on chores. Funny how kids can remember to ask if a friend can come over, but they forget to vacuum their room! We had a rule at our house several years ago that at 8pm every night, you had 5 minutes to pick up. My hubby even had an alarm on his phone. When it went off, watch the kids run! Whatever was on the kids' floors after that time was donated or trashed. We got away from it when we moved 3 years ago. The rule just got reinstated this past weekend!! No more Legos on the floor for mom to step on in the mornings. No more dirty clothes on the floor. No more mess!! We do have to clean on Saturday mornings...or Friday nights! I plan on picking one Saturday a month to complete the one room deep cleaning. That means furniture gets moved around to be cleaned under, air vents and fan blades are dusted, baseboards get a wipe down. Some rooms in our house have wood paneling so they get dusted as well. That one room gets my focus for the entire day if needed. Any craft projects or major redecorating for that room can happen that month too. It keeps me from getting overwhelmed with projects to complete! 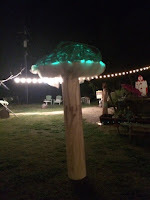 I can go back to my Pinterest boards, search for the projects I wanted to do for the living room and complete the one or two that I really want to do! I am hoping this will help keep our house tidy in case of any unexpected guests during the week. Plus it will cut down on the work load on the weekends. Follow Melissa's board LSG Blogs on Pinterest.